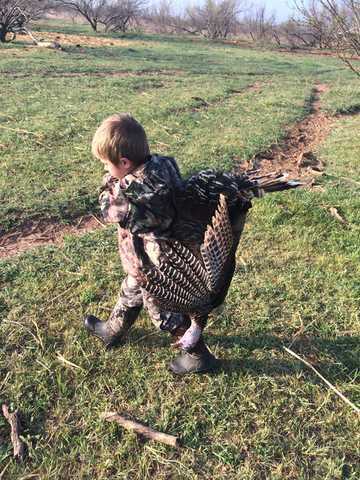 This was my Son's first "real" hunt. He is a normal 7 yr old, full of energy and almost impossible to keep still for more than 2 minutes. That being said, I did not think this hunt would be too successful. 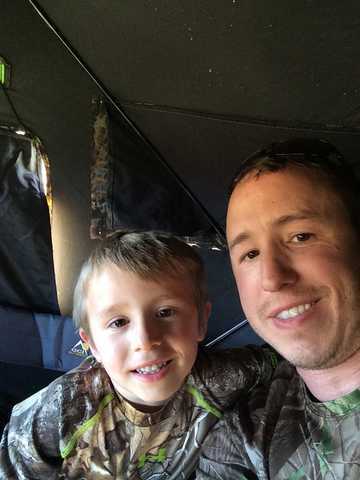 Quade was very excited to get to go hunting this year. 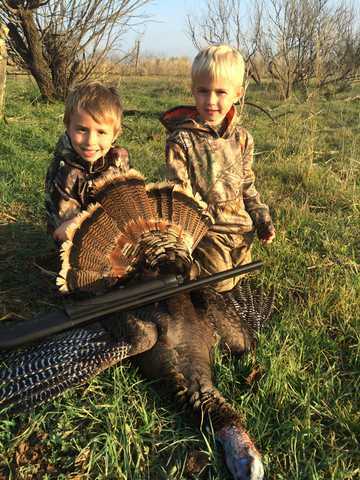 Uncle Tony, Parker and the two of us decided to take a trip to Mangum Oklahoma for youth turkey season. We arrived on Saturday and set up three different blind setups. The boys seemed to be more excited to play in the dirt and throw sticks then "hunting". We finally got done with the set up, and decided it was time to let the boys practice shooting. Quade had shot a 17hmr, 22lr and his pellet gun. That being said, I was a bit nervous to let my 45lb 7yr old shoot a "BIG" gun. I went out the week before and purchased a Remington 20 gauge youth model. We decided to let them shoot the smaller guns and then work up to the "big dog". When Quade got behind the gun, I was being a bit over protective and was trying to be behind him and let my shoulder absorb the recoil. We let him shoot it this way a couple times, and to my surprise he wanted to shoot it all by himself. He did very well, even if it looked like he was being kicked by a mule every time he pulled the trigger. Now that we had that out of the way it was time to go hunting. This was the part that I didn't think would go very well, making the energizer bunny sit inside a ground blind for several hours seem to be a impossible task. Tony and I had already talked about it and decided that as soon as they lost interest we would go and not make them sit there, even if it was prime time. We didn't want to burn them out. 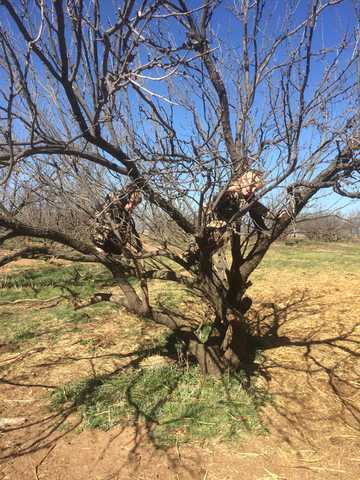 Surprisingly they did very well; there was some action for most of the hunt, some hens, cows, quail, dove, but no shooters. We went back to the hotel for the night, after a solid hour of jumping on the beds; we got some rest before the morning hunt. We woke up a few minutes late, but figured it wasn't a big deal, because it as a bit overcast. 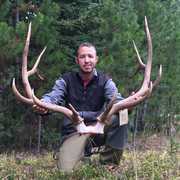 We arrived at the blind and after getting 4 people and the kitchen sink inside our double bull, we finally set down. About 30 seconds later a tractor drove by the road beside us and that set off the thunder chickens that were no more than 50yds from us and closing fast. Everyone's hearts were pounding; Quade positioned himself behind the Caldwell shooting pod, as if he had done it a hundred times. There were 8 jakes that came in on a string to the decoys. 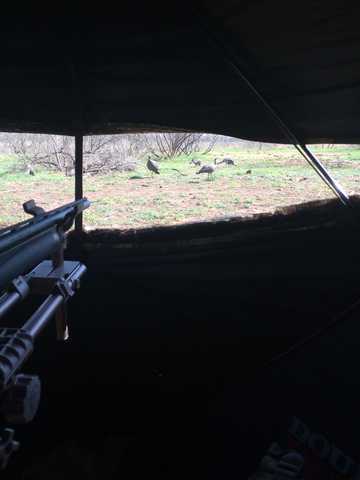 Quade was lining up on one of the left birds, about that time 4-5 of the others all lined up behind him, Tony whispered in his ear to shoot the right bird, Quade shifted over and eased off the trigger, and with one shot, rolled his first bird ever. He turned and looked at me with the largest grin ever!!!! I was one proud dad!!! After we high five'd all around the blind, He wanted to text his Mom and let her know that he got one! We got out of the blind and took a hundred pictures in every pose you could think of. After the trip we arrived back home. He had to brag to his little brother and mom; he told them all about it. That evening he was saying his prayers before bed, and after thanking God for the turkey he got this year, He asked God to give him a BIG ONE next year! I have a feeling this boy started an itch that's going to take a lifetime to scratch. 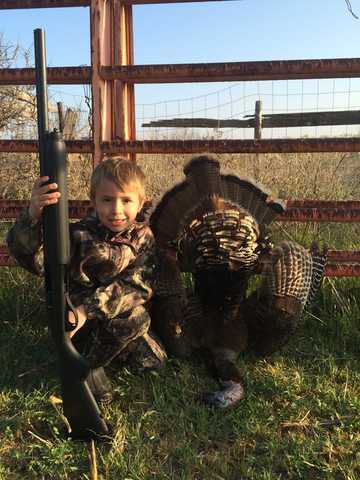 My dad took my 5 yr old son hunting about a year before my dad died. They got a huge Tom turkey. My son is 20 now, and that day is still his most vivid memory of "Pop". 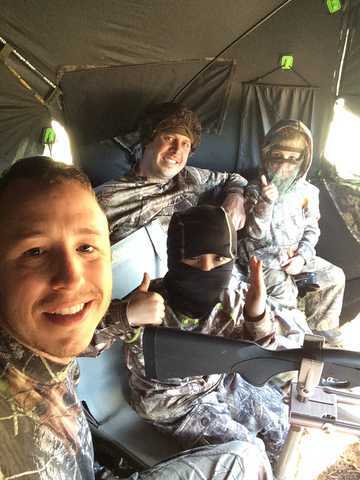 Thanks to your story, I was able to relive that great day, as well as when Pop took me deer and turkey hunting. Thanks Rorbert and congrats Quade!